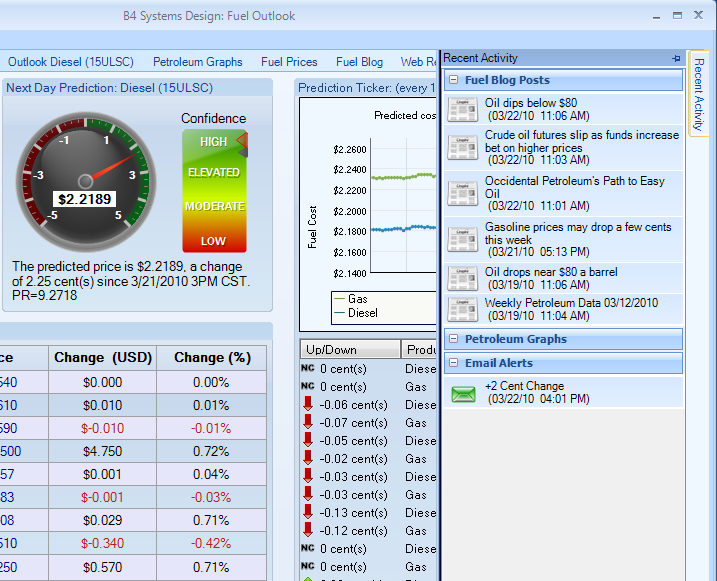 B4 Systems Design: Fuel Outlook, fuel price predictions, gas and diesel predictions, petroleum news. Try it now! First 2 weeks free on signup. 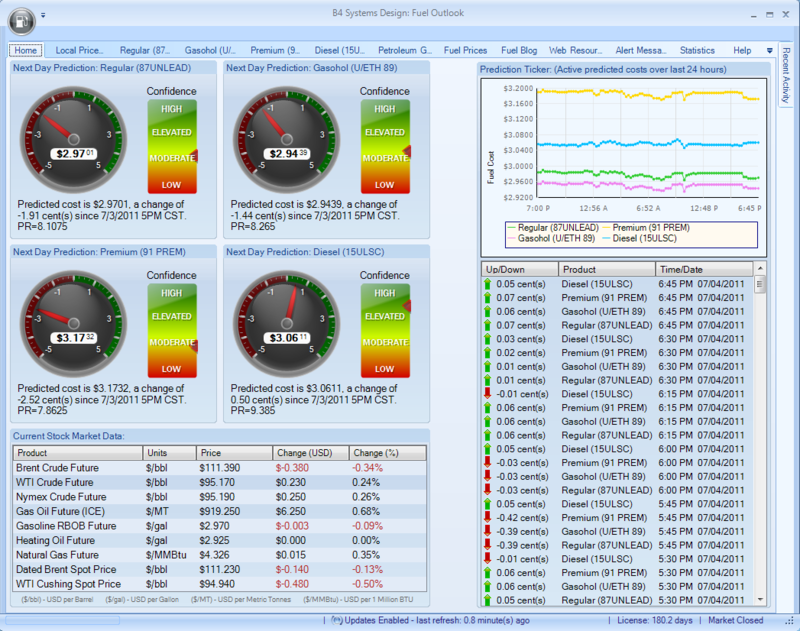 Fuel Outlook is a software application you install on your computer that predicts fuel prices based on multiple factors, calculations, and data. 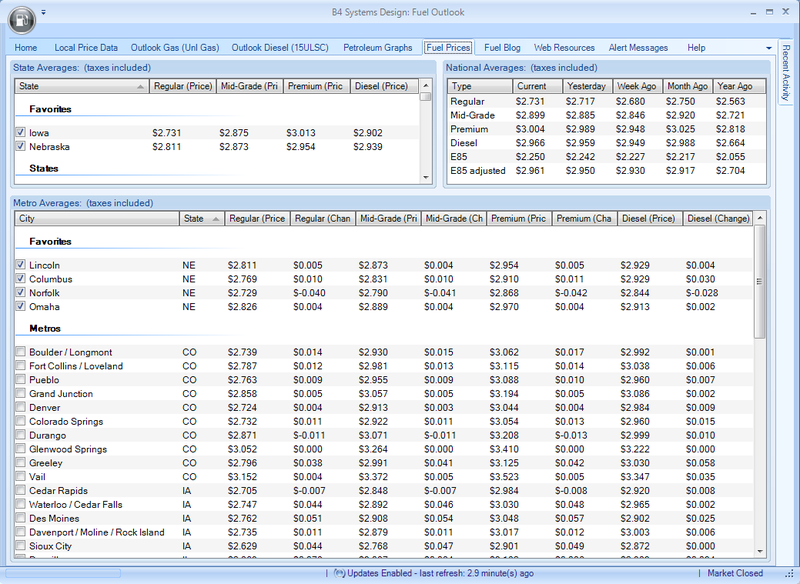 Fuel Outlook requires you to enter a Local Price or Cost for a fuel product and uses this in its Local Price factor calculations. 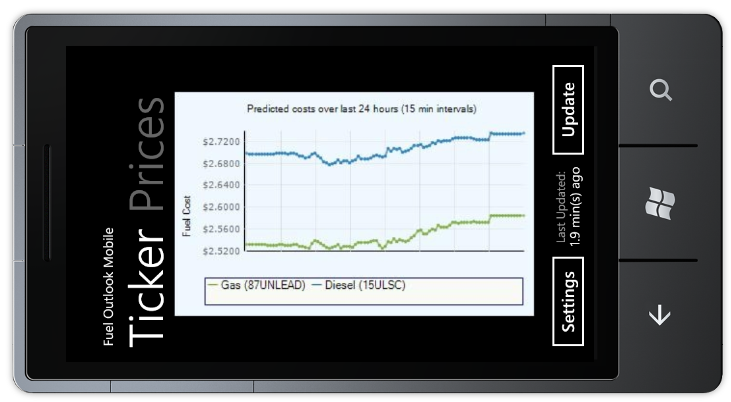 Fuel price prediction calculations are performed hundreds of times throughout the day and are downloaded by Fuel Outlook when it is running. The predictions are displayed in real time on the Home Tab in a nice dashboard view. 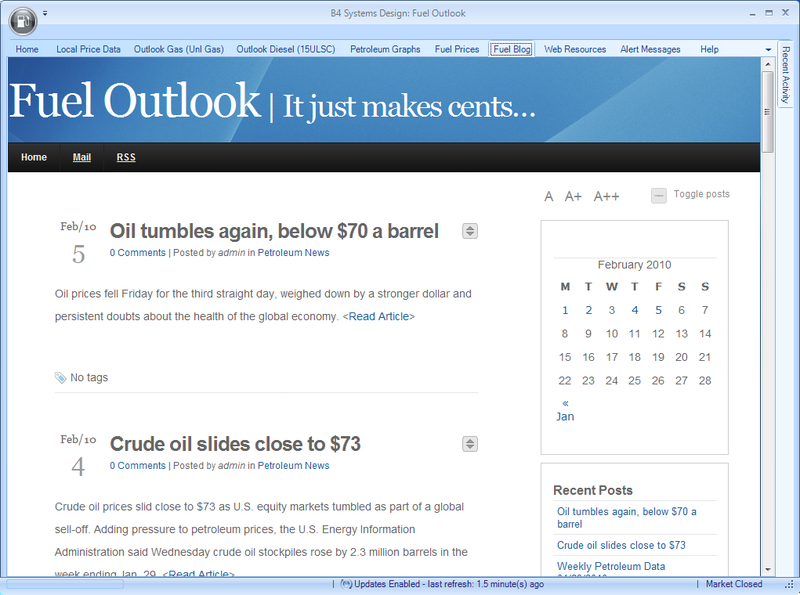 History data, graphs, news feeds, blogs, area fuel prices, and alerts are all additional parts of Fuel Outlook. Try it now! Free trial offer on new sign-ups*. With all the benefits, why not? 1.) For as little as $3.33 a month you can save hundreds on a single purchase of fuel! 2.) No risk, Free Trial on new customer sign-ups*. 3.) And not to mention the fact you can use the software as a business expense for a tax write-off… you really have nothing to lose! *Offer subject to the terms of the licensing agreement. Fuel Outlook™ just got better. 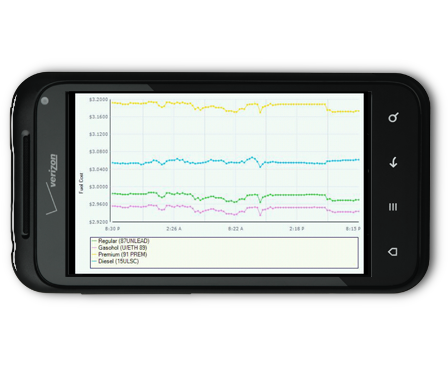 …Introducing Fuel Outlook Mobile for Android and Windows Phone 7 devices. 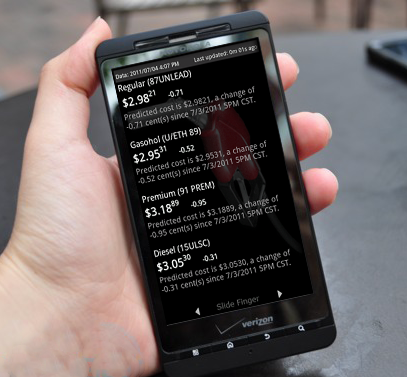 You can now access your Fuel Outlook predictions in real-time on your phone. 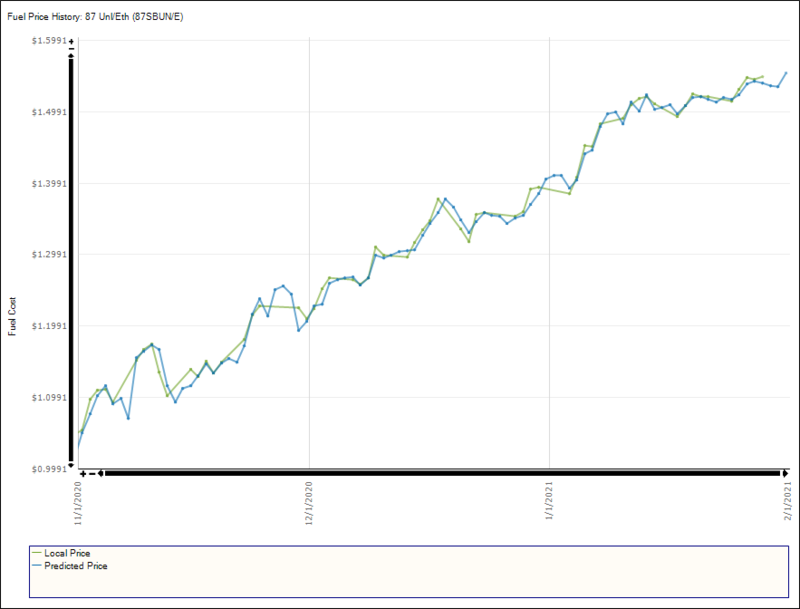 With access to your live predictions as well as the prediction ticker graph, you never have to wonder what is happening in the market while you are out. *Currently supported phones include Android (OS v2.1 and higher), and Windows Phone 7 series mobile devices. Data charges may be incurred with phone usage as it uses available internet or cellular data network. 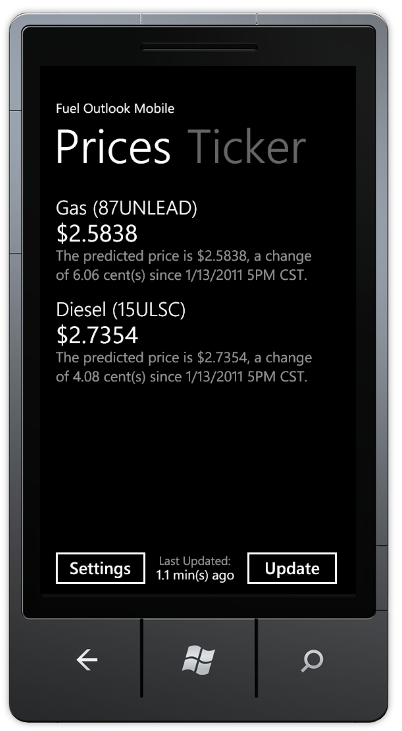 **Fuel Outlook Mobile for Windows Phone 7 has a one-time App Store fee of $0.99 that covers the Marketplace costs. Once purchased, the application is added to your Windows Live account and you can install and move it to any of your supported devices. * This data is my case study compiled with data since October 16, 2009. All predictions were calculated using Fuel Outlook software and all actual local price data was obtained from Growmark, Inc. price notices. Prediction costs are recorded at 5PM CST. †Please read the <License and Subscription Terms> prior to purchasing and installing software. By installing and using the software you agree to the terms laid out in the <License Agreement>. To get your *No Risk* Free Trial of Fuel Outlook™, simply click the link below and fill in the form. There are no upfront costs and no charges during the free trial. And with fuel price predictions and changes sent directly to your phone, visual fuel price trends and graphs, and fuel news right at your fingertips, you will definitely notice the benefits within days. So what are you waiting for? You can start saving money on fuel purchases and sales right now! *After sign-up, you will receive an email with your license UserID/Password. You can download the Fuel Outlook installation from the <Download Fuel Outlook> link available on the homepage using your license UserID/Password. If you have any questions or would like assistance please email us at B4SystemsDesign@gmail.com. 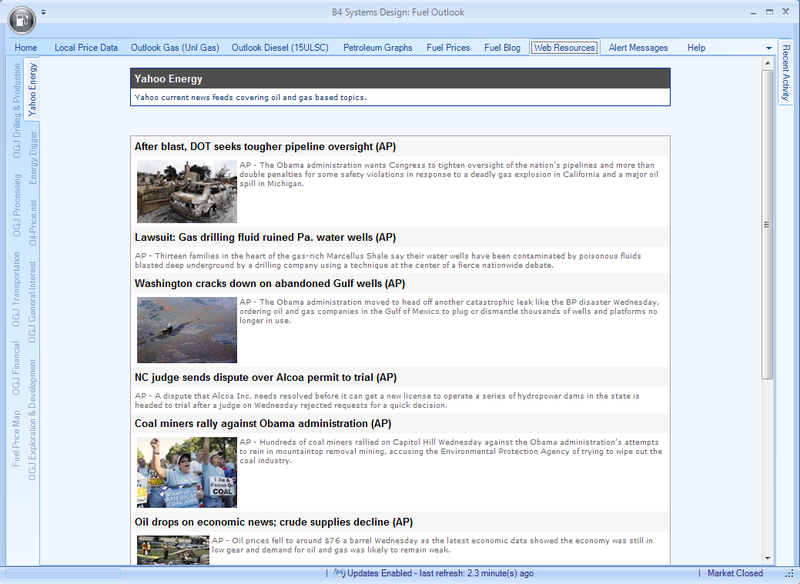 †Fuel Outlook is licensed for use on a single computer. You can purchase additional licenses at the cost of $2.50/month more. For more information on multiple license fees and discounts contact Sales@B4SystemsDesign.com. 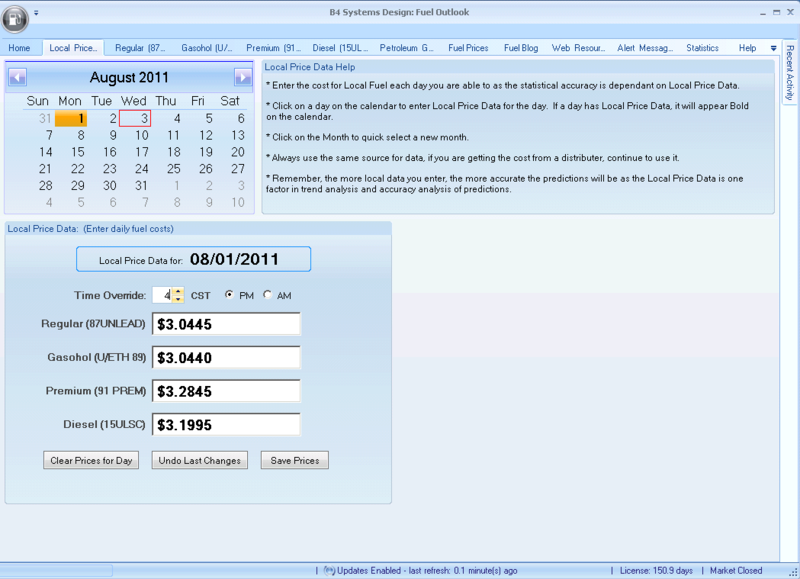 Fuel Outlook is available as a single purchase license for 1 month, 3 month, or 1 year pricing. You can also purchase a subscription license, in which automatic recurring payments will be charged for you. You can cancel your subscription at anytime by contacting B4SystemsDesign@gmail.com or via the Unsubscribe available on the Support Tab. *After sign-up, you will receive an email with your license UserID/Password. 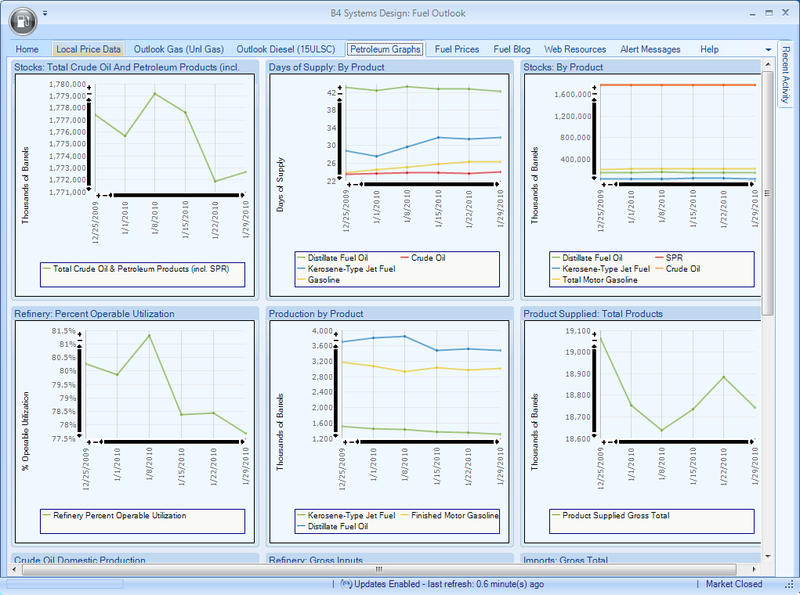 You can download the Fuel Outlook installation from the <Download Fuel Outlook> link available on the homepage. 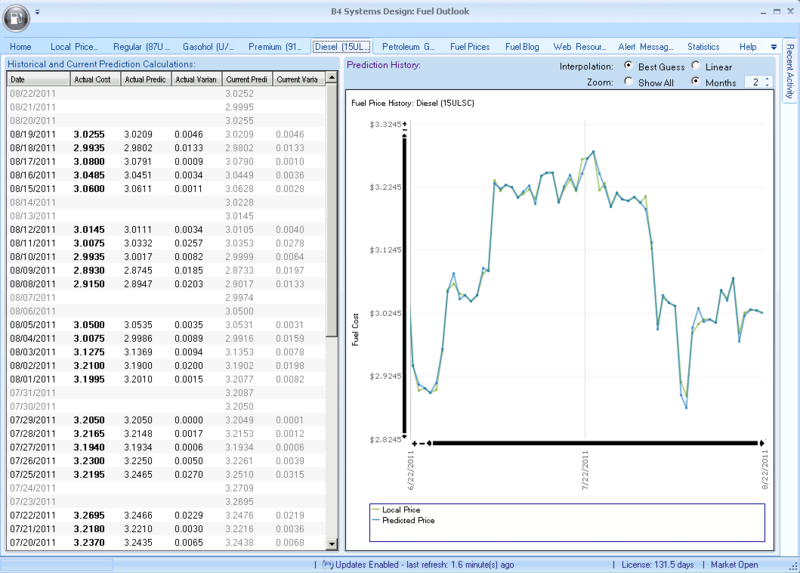 If you already own a license to Fuel Outlook and would like to purchase discounted additional licenses, you may do so at the rate of $2.50/month per additional license. Please contact us for help on this additional questions related to licensing and discounts. If you already own a license to Fuel Outlook and would like to transfer it to a different computer, you may do so. Simply install the software on the new computer and enter your UserID and Password for the old computer. You will be asked if you wish to transfer the license to the new computer, effectively disabling access on the original pc. 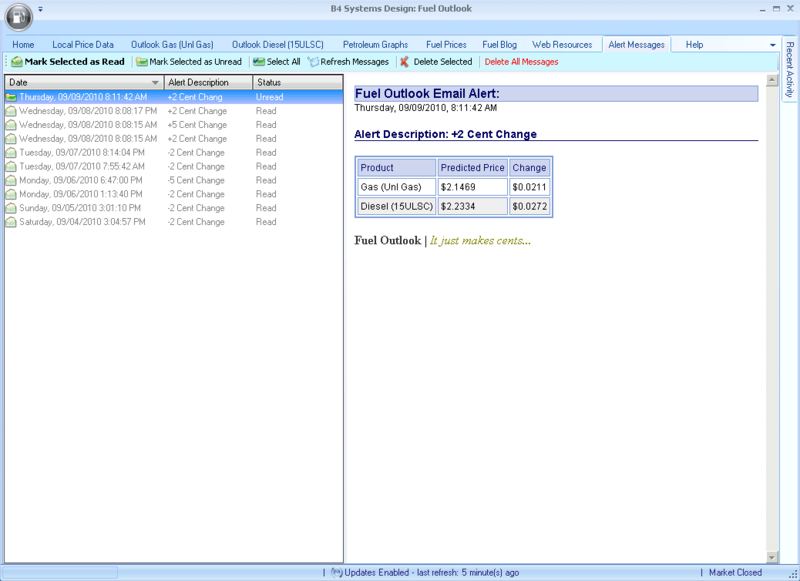 Fuel Outlook subscriptions are setup either monthly, quarterly, or yearly and are set to automatically renew. If you wish to cancel your subscription at any time, you can do so from your Paypal account, from the link below, or by contacting B4SystemsDesign@gmail.com. Your subscription will be canceled and your access to the Fuel Outlook database will expire when your last payment coverage is complete. Due to overhead of managing the database access, we require 24 hours notice prior to cancellation. *Please read the <License and Subscription Terms> prior to purchasing and installing software. By installing and using the software you agree to the terms laid out in the <License Agreement>. Hi, I’m Caley, founder and programmer for B4 Systems Design, Inc. I want to thank you for visiting my site today. I grew up in rural Nebraska and come from a family with a past in fuel and petroleum products. For three generations, my family has delivered gas and oil to farmers in the rural Humphrey area. 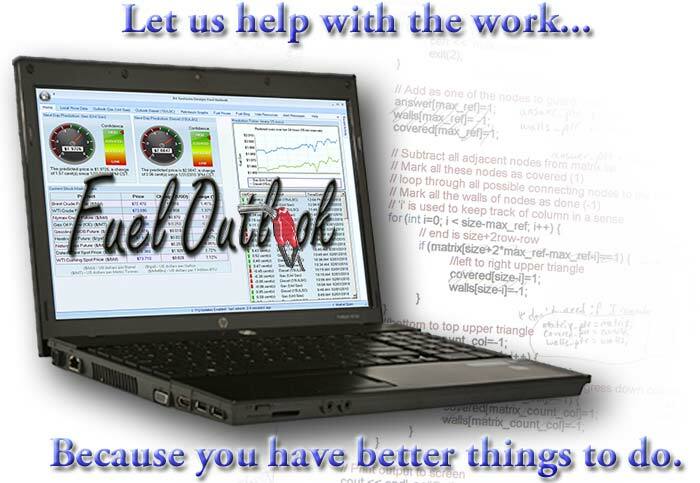 Growing up around petroleum has offered insight and knowledge that I have used developing Fuel Outlook. After graduating college in 2003, having achieved a bachelor of science degree in Computer Science and Mathematics, I moved to Omaha to pursue a career in IT. In 2007, I created a product to help my father with his oil business. 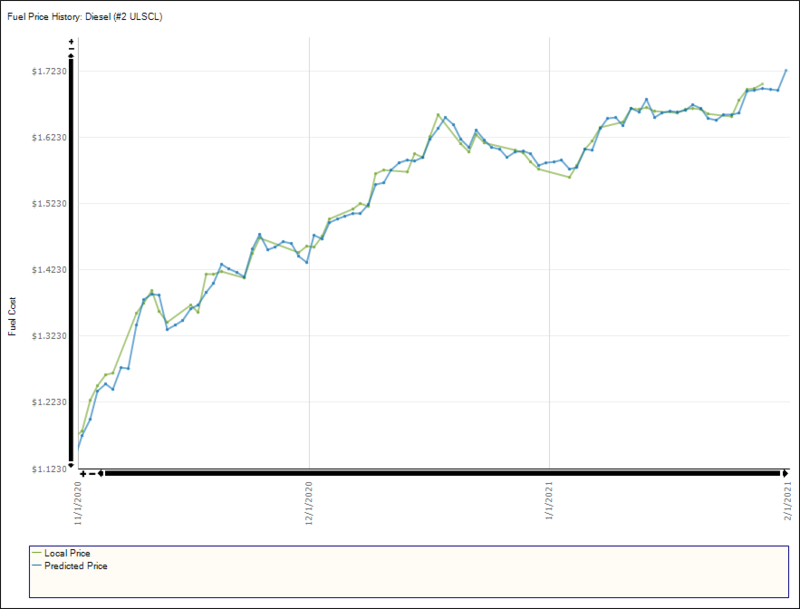 This has since grown to become Fuel Outlook and incorporates fuel price predictions and alerts at its core. Fuel Outlook can assist you in making more sound decisions about buying and selling fuel on a day to day basis. I truly believe you will benefit from using Fuel Outlook and I am excited to offer this product to you. • Be aware of the market. Know when prices are going up or down so you don’t ending up selling gas at a loss. • Visual gauges, graphs, and lists. Data is provided in multiple formats that make it easy and fast to understand. • Price alerts via email or text. Be notified when prices are changing in your email or on your phone. • Petroleum news feeds. Know what is going on with oil and petroleum in the world today. • All in one solution. We know that your time is valuable, so we strive to bring you all the data you use in one place. Doing the work to get you an edge is what we are here for. So relax, and let us help take the guesswork out of buying and selling gas. 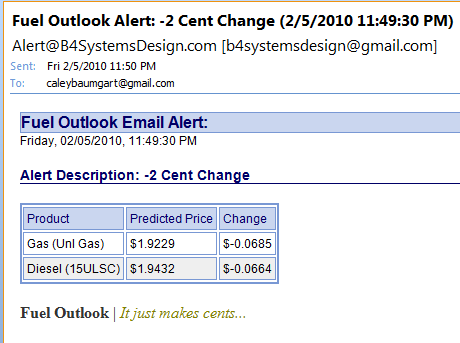 Fuel Outlook, It just makes cents.